Ink plus Neocolor II water-soluble crayons + travel watercolor palette. Hope you enjoy! Peace and Happy Wednesday to all. Hi Laura – I’m headed over to my local D. Blick store tomorrow. They are having a grand reopening sale, I’ll be checking out these crayons. Beautiful flower studies today. Thank you Laura, a class would be fun. 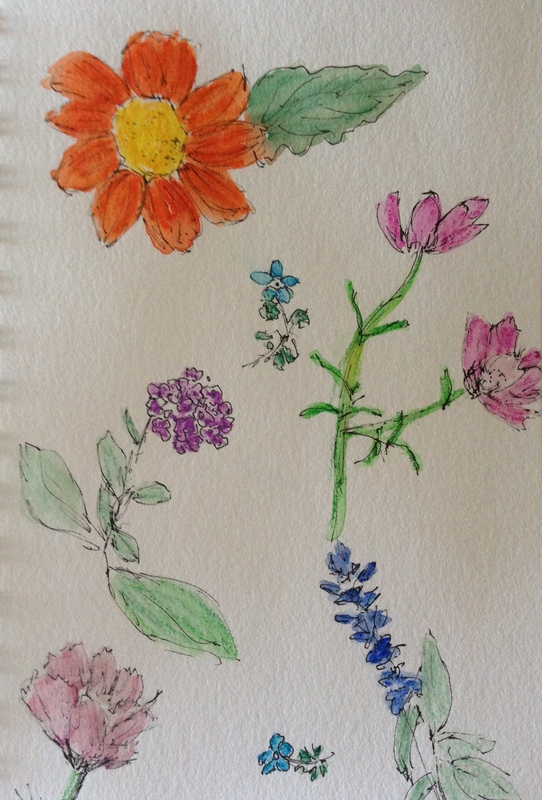 Life drawing…with flowers! So lovely! I really like that orange flower at the top. Beautiful flowers :-). My favorites are the blue, mauve and turquoisy ones… they are so delicately formed yet vibrantly colored. Thanks so much, Myriam. I believe the really small blue ones are called Chinese Bluebells. They were fun to sketch. I looked up Chinese Bluebells. They’re as lovely and delicate as your sketch. I haven’t seen any around here, but I’ve seen other petalled cuties. I think they are Chinese Bluebells, Jill. I’ll double-check with the gardening man. I’m pretty sure…. Glad you enjoyed them! That’s lovely! I wish I could draw and paint en plein air. My perspective and proportions are always off when I try. I have a much harder time with landscapes and buildings. Maybe I’ve practiced so much with flowers in vases that I’m getting better? Not sure. I do crouch a lot. And I try to avoid foreshortening at all costs. 🙂 Glad you enjoyed them!